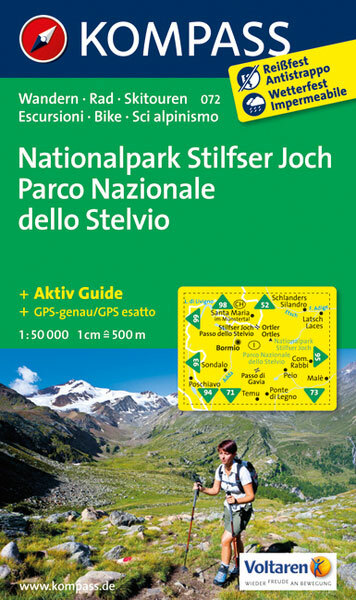 Parco Nazionale del Stelvio (NP Stilfser Joch) on a GPS compatible hiking and recreational map at 1:50,000 from Kompass printed on durable, waterproof and tear-resistant synthetic paper. This title is part of an extensive series of walking maps from Kompass covering selected areas of Italy at mainly 1:50,000, with a GPS compatible, contoured topographic base, extensive overprint for hiking routes, various types of accommodation, numerous recreational facilities, places of interest, etc. The series covers the northern part of the Italian Alps, the lake region of Lombardy, the Dolomites, Italian Riviera, selected parts of Tuscany and Umbria, the Sorrento Peninsula, and the islands of the Tyrrhenian Sea. Coverage of the Dolomites by Kompass at more detailed scales (mainly 1:25,000) is listed on our website in a separate series. Contour interval varies according to the terrain from 100m to 25m. All the maps highlight local hiking paths and, where appropriate, long-distance routes or via ferrata trails. Symbols indicate various types of accommodation such as selected inns and hotels, campsites, mountain huts and refuges, etc. Most titles also show cycle or mountain bike trails and/or ski routes. Selected titles include on the reverse panorama drawings of the area, as indicated in the individual descriptions. Unless indicated to the contrary in the individual description, all the titles are GPS compatible, with latest editions providing a 2-km UTM grid. New editions are now published on waterproof and tear-resistant synthetic paper, as indicated in the individual description. BOOKLETS: PLEASE NOTE BEFORE ORDERING! Many titles come with a booklet describing the area and/or various hiking routes. Unless indicated in the individual description that the booklet includes English, these booklets are in Italian and German only. The booklets are not necessary to use the maps since, as stated above, full English language map legend is provided. Kompass are Europe’s largest publishers of walking maps, with extensive coverage of hiking areas in other countries, all listed on our website.